Even though it was also low season in Roatan, there were a couple of Divemasters and Instructors in Training, so even if we were only two fun divers, there were always enough people around to fill the boat and visit cool dive sites. 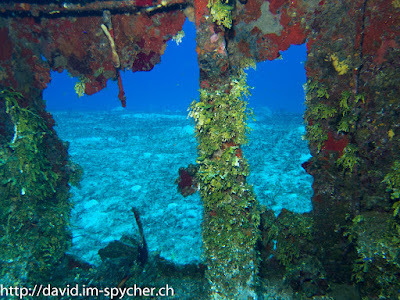 The first highlight was on the second day, when we visited the El Aguila Wreck. Similarly to the Halliburton in Utila, this wreck was also sunk on purpose, however shortly after it was sunk, Hurricane Mitch came through and broke the ship into three parts so that it now looks like a real wreck ;). The wreck offered several options for penetration and we visited them all. Strangest was penetrating at the back, where the ship was 45° tilted and after entering everything was askew which did challenge my orientation sense :). 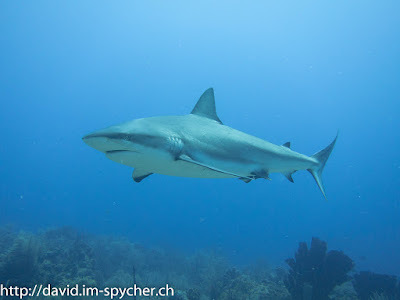 Already back in Utila I saw advertisements for Shark Diving in Roatan and so I booked this dive for Wednesday, it was offered by a company in Coxen Hole, but a short cab ride took me there. We went down to 20m and were able to sit/stand in front of 2m high corals, which ensured that no Sharks would turn up behind us. At first we just watched the Sharks, there were about 15 female Caribbean Reef Sharks present, but since there was no current, we were allowed to swim around after a while. And that was a breathtaking experience, every way I looked, I saw at least one Shark :). At the end we went back to the Corrals and the Sharks received the fish they came for, after a short frenzy everything was eaten and the Sharks disappeared. We then had the opportunity to look around the bottom for Shark teeth, and even though I was more interested in looking at the remaining Sharks, my roommate gave me one of the teeth he found :). 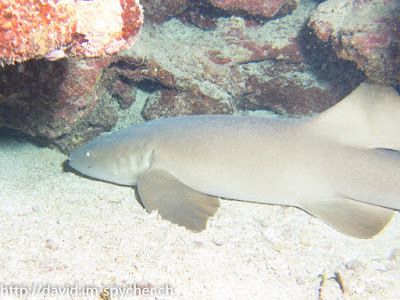 Another highlight in Roatan was, when we discovered a sleeping Nurse Shark, he wasn't bothered by us and so we had the opportunity to take a couple of pictures. Diving in Roatan was very nice, even though the visibility was at times quite murky. In my humble opinion, the diving in Roatan was better than in Utila. On the other hand, Roatan is much more touristy, with cruise ship passengers coming through several times a week, and thus the cost of food was more expensive. But the real high point of diving in Roatan was Coconut Tree Divers, with its cool people and commradery. Every evening we met up for a beer and a chat and sometimes a small group even continued for dinner. After ten days it was time to say good-bye and I took the ferry back to La Ceiba, the ferry from Roatan is much larger than the one to Utila and so the crossing was much more comfortable, and then the bus back to San Pedro Sula, where I stayed the night to catch an early morning flight to Quito through Miami.